"Nutmeg and Greek nonfat yogurt are the secret ingredients to this comforting steakhouse staple." In a 3-quart saucepan heat butter; Add flour and cook 2-3 minutes to create a roux. Slowly whisk in chicken broth and blend until smooth (mixture will be thick). Bring to a boil. Reduce heat to simmer, add spinach and heat through. Add yogurt, salt, pepper and nutmeg and heat through. Serve. These reduced calorie, twice-baked potatoes are a family favorite. Tip: Recipe can be doubled for a larger crowd. Easy to make and very good. I would definitely make this again! The recipe was easy and quick. However,it is very bland. That said, will probably make again. Even the pickiest of picky eaters RAVE over this recipe. 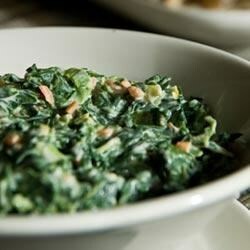 No one would ever know it's a healthy take on creamed spinach. It's wonderful! TIP! Use fresh spinach - it is way better! I actually made it using vegetable broth in place of chicken broth and served it tossed with penne pasta. It was a nice change from the usual tomato sauce. This recipe was a hit with the whole family... including my 10, 8, and 5 year olds! Super nutritious to boot! This was really good, I did use 1TBSP of coconut oil instead of the butter and sauteed a sweet onion and garlic before I did the flour. I will be making this again!